My family recently took a trip to Springfield, Illinois. Springfield is a great town full of rich history, specifically in relation to Abraham Lincoln and the Civil War; and my boys love learning about history. Lincoln lived in Springfield for many years prior to heading to the White House. He is also buried in Springfield. 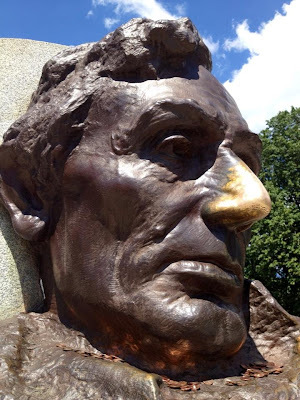 When we arrived to Lincoln's tomb, we noticed a large bronze statue of his head. It was hard to miss, not only due to its size, but also due to the shiny finish on the nose. Some believe rubbing Lincoln's nose brings good luck, and let me tell you that nose glistened! Have you ever had a good luck charm or ritual? A lucky shirt, pair of socks, or pants perhaps? I suspect all of us could name at least one item or thing we've been told will bring good luck – a heads up penny; a four leaf clover; a rabbit's foot; lucky number 7, Abraham Lincoln's nose, etc. I spent a good deal of my fifth and sixth grade school years hunting four leaf clovers. There was a particular area on my school playground in which I'd found a couple of these "lucky" little gems, and I figured the more I continued to find the luckier I'd be! Now, I don't know what the rules are when it comes to four leaf clovers, but I fully expected all my dreams to magically come true and wishes to be granted. Apparently, the "luck" they deliver is much more subtle than that though...much, much, much more subtle. In fact, come to think of it, I have yet to see any of that "luck". To be honest, I don't know if I even have those four leaf clovers any more. I tucked them inside a book long ago, and eventually lost track of them. What was so important to me then, I could take or leave now. I think that's the way it goes with many of our lucky charms though. We place faith in them believing their sole purpose is to give us luck and grant our wishes. But, eventually we give up when we don't see the results we want, when we want, and we tuck away our charms until the next time we need a little extra help in the ol' luck department...hoping then we'll hit the jackpot and get everything we ever wanted. Sometimes I have faith like that – a lucky charms kind of faith. I lay out my requests to the Lord and then expect Him to magically provide. But, God isn't in the business of playing Fairy Godfather. He is not some four leaf clover or lucky penny. And, His sole purpose is certainly not to give luck and grant wishes when I stomp my feet and make demands (not that I would ever do that...ahem). Be cheerfully expectant and pray all the harder...good golly I need to remember this! Maybe you do too. Though the Lord may not give us what we want, when we want it - He always, ALWAYS has our best interests in mind, and He always, ALWAYS provides at the perfect time. I know this. I've seen Him do it time and time again. Sometimes I just need the reminder (and some patience!) to wait and to trust and to keep pressing on. What about you? Are you feeling discouraged with regard to something or someone you've been praying over? Let's fight that lucky charms kind of faith together – cheerfully expectant and praying all the harder. *A few years ago, I was asked to write a song about waiting on the Lord. I’d be honored if you took a listen to "They That Wait" today. God is good.